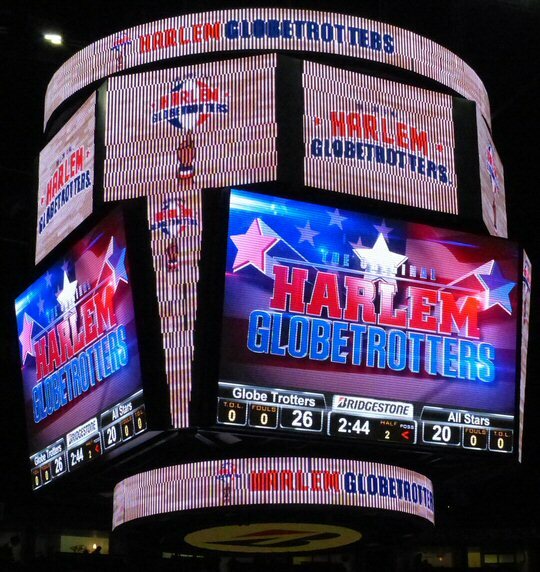 For 91 years the legendary Harlem Globetrotters have been providing family fun with their unique blend of sportsmanship combined with slap stick comedy. 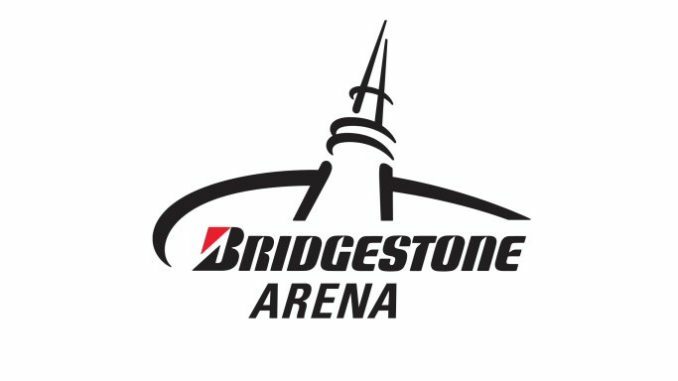 The team’s 2017 season is underway which included a stop at the Bridgestone Arena in Nashville, Tennessee on January 15, 2017 where the Pred’s home ice had been converted to a basketball court. Plenty of fans of all ages were in attendance for Sunday’s afternoon game against the World All Stars. 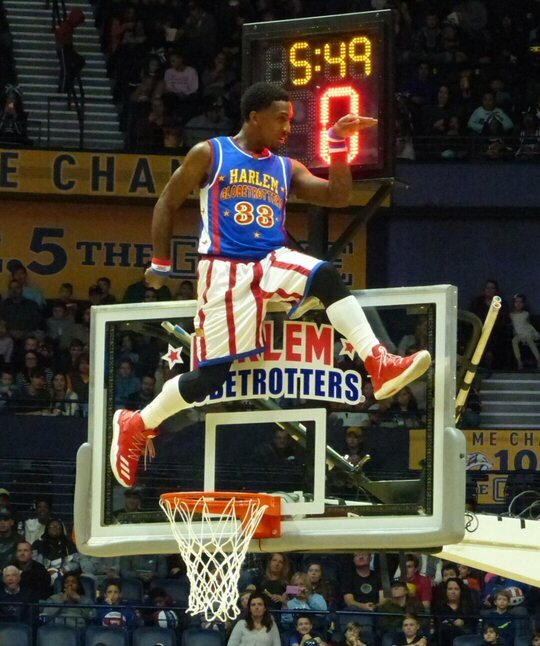 The Harlem Globetrotters are always slam-dunk entertainment. In addition to entertaining families around the world with their ball handling wizardry the Harlem Globetrotters are Ambassadors of Goodwill. They are involved in community outreach programs that includes bully prevention, encouraging physical fitness and character building. Team members both men and women also visit fans who are unable to attend games. The Globetrotters work year round. They offer various ticket options with opportunities to sit courtside paired with the possibility of participating in a competition or skit. 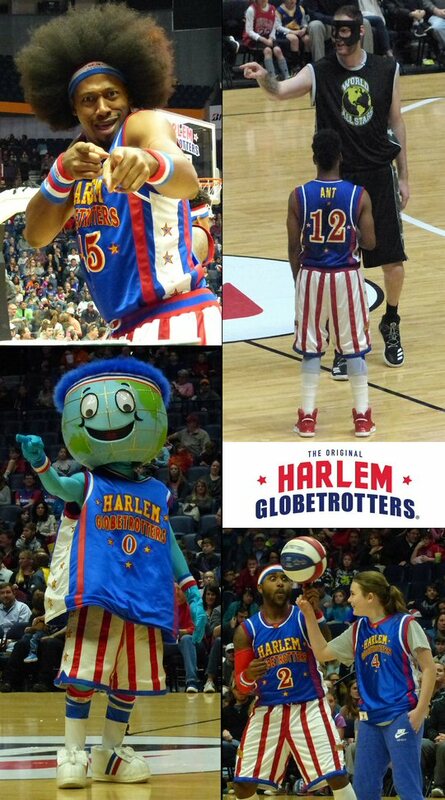 Pre-game included music, interactive events for the crowd and Globie the Globetrotter’s mascot showing off his dance moves. The World All Stars who came out first were not shown much southern hospitality in comparison to the Globetrotters who make each arena they play at their home court. Both teams warmed up with the Globetrotters spinning balls and demonstrating other signature moves. 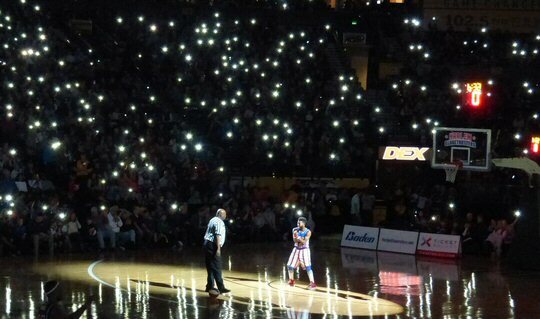 After the National Anthem and some pranks the game started with the Globetrotters scoring first in one of four quarters. This is how you walk like a Globetrotter. Although each period is only ten minutes the squads encounter all kinds of delays between dribbling and shooting hoops. Ant the Showman was often the instigator of ANTics that interfered with scoring. At one point Ant grabbed a red purse from a lady in the audience. He handed it off to an All Star who was not pleased. This trick evolved into a search for the purse owner along with gift giving that resulted in a comical conclusion. The World All Stars had enough of these distractions so they introduced their secret weapon – a very tall player wearing a mask named Cager who could easily reach the basket to score points. Despite Cager and his WWE-style trash talk the Globetrotters were in the lead at the half. During intermission folks had time to purchase merchandise that could be signed after the match as it is the Globetrotters custom to stay an extra half hour for an autograph session. The red, white & blue basketballs appeared to be a popular choice. Local cheering squads of various ages entertained us also. The legendary basketball squad lit up the Bridgestone Arena. The second half started with Ant soon persisting with his antics while Cager was accused of playing dirty. Both squads continued scoring while looking for a win. Now most of us presume that the home team is always going to prevail. However, according to their website the Globetrotters have lost 345 games over the course of their nine decade career. Yet with over 26,000 wins their percentage is a little over 98% – no other team in sports can touch that. In the fourth quarter in perhaps the most creative trick of the afternoon the Globetrotters presented a football play that resulted in a touchdown that was questioned. The Globetrotters had to rewind and review the move in slow motion which was acted out by the team. The football moment also included passing around Entenmann’s donuts who are one of the team’s sponsors. As the game was coming to a close fans were asked once again to make some noise. The final score was 66 to 63 in favor of the Globetrotters. Can you put your finger on why the Globies are so much fun? The Globetrotter delivered plenty of family fun on Sunday afternoon in middle Tennessee and they will be spreading their unique brand of good cheer to many other global cities in 2017. Throughout their history, the Original Harlem Globetrotters have showcased their iconic talents in 122 countries and territories on six continents, often breaking down cultural and societal barriers while providing fans with their first-ever basketball experience. Proud inductees of the Naismith Memorial Basketball Hall of Fame, the Globetrotters have entertained hundreds of millions of fans – among them popes, kings, queens, and presidents – over nine thrilling decades. The Bridgestone Arena in the heart of downtown Nashville hosts many sporting events such as the Globetrotters. Upcoming attractions include Amsoil Arena Cross, plenty more Predators hockey games, Dierks Bentley, Winter Jam and a Tribute to Randy Travis. 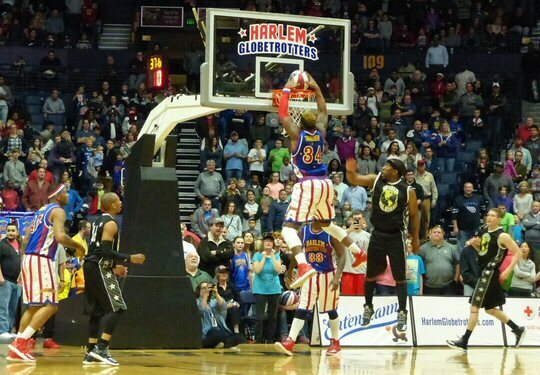 What do you know – the Globetrotters win again in Nashville.